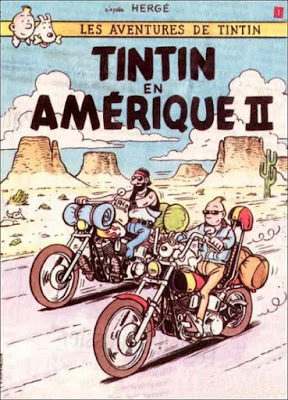 TinTin takes to the highways of The West in this conceptual idea of an adventure for our young intrepid hero. Like some gallic Wyatt and his knight-companion Billy ‘Haddock’. Snowy is erstwhile George Hanson and no doubt the Thompson Twins represent a bifurcate counterculture; split between the sixties laissez-faire and the serious seventies just around the corner. 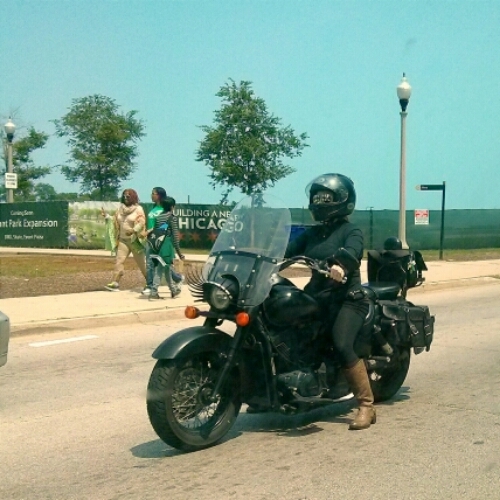 As Mick sang and Keith picked and so the world goes on… I saw this motolady hefting this Honda vee twin through the midday traffic along Roosevelt. Black upon black with mirrored shades and a cyclops eyelash up front. She looked intent. From the seminal ‘Stones album Aftermath in ’66. 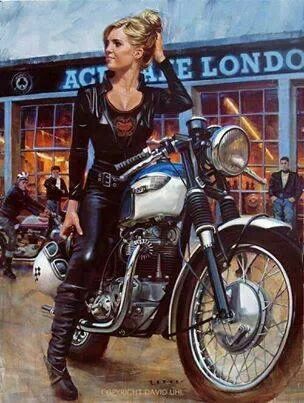 Glorious painting of an evocative scene by the talented David Uhl. Www.uhlstudios.com mostly this studio paints Harleys but the odd Brit Iron is daubed on the canvas. Dreary English skies, warmly lit caff where a hot cuppa is supped and chip butties can be had. Bonny Bonnie! 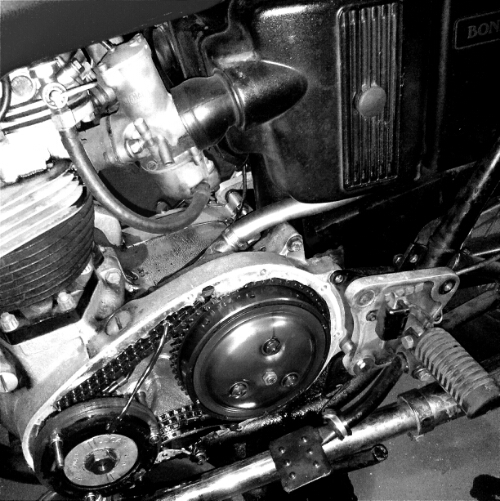 Midsummer Mechanics: I need to strip the clutch due to slipping at higher revs. It comes down to modern oil being used: way to slippery for the old Triumph semi-wet primary case which shares oil with the crank. I need to degrease and decontaminate the friction plates. The first gear shift has been getting a bit notchy too; typical of grabby action. I have half a mind to pull the basket to get into the sprocket and up the size a tooth or two for a better top speed. A nice couple of new Triumph seen around Evanston earlier today. 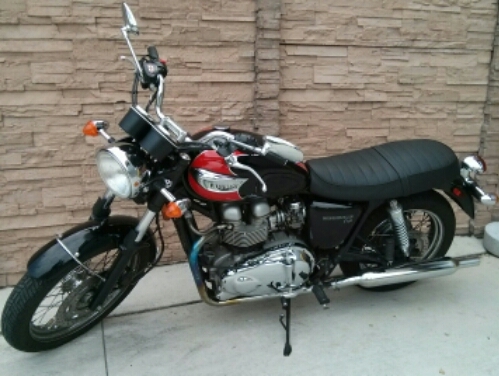 A crisp T100 Bonneville in classic black and red color with shiny covers. 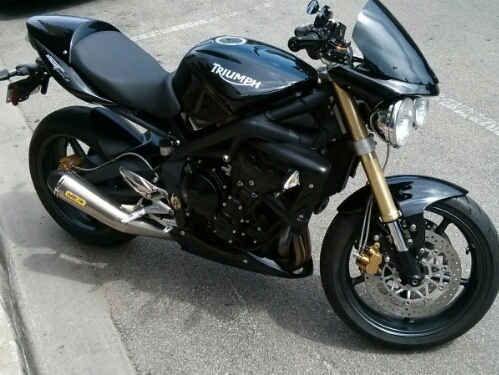 The other is the neat and tight Street Triple… The mini-muscle though none the weaker. A 600 with looks to kill. Black is an appropriate finish. 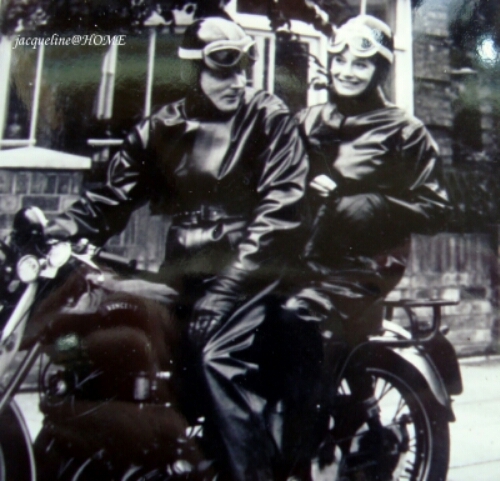 Wonderfully evocative photograph illuminates a couples youth as rider and pillion aboard a worthy steed: The Vincent. 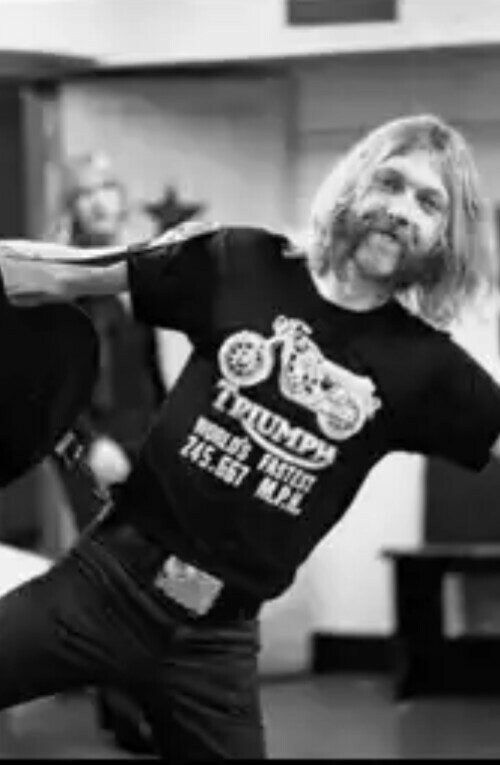 Home-fashioned leathers give a ‘we don’t care’ attitude – ‘ heck, we’re on a Superbike! But we do need to be clad for blighty roads and climate’. The image is labelled In & Aunty Corice. Fabulous! 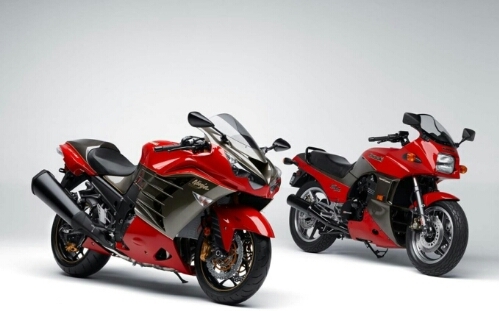 The older Hammer was produced until 2003 in Japan and the younger Pretender started in 2006; so there was a minor break between these bookend Ninjas. 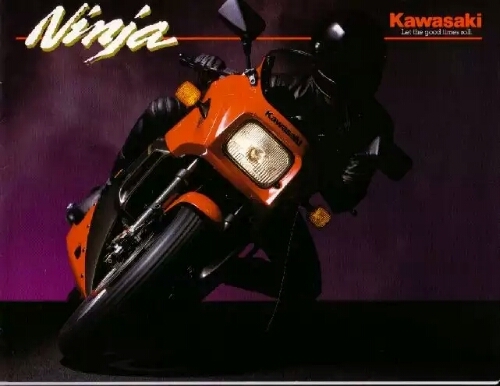 As a side note the 900 Ninja engine was taken as the cue by John Bloor when developing his early modular triple and four engines for the relaunched Hinckley bikes. 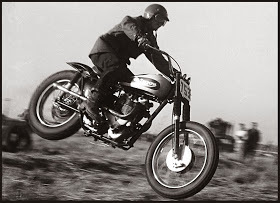 A flying moto roaring across some grassy knobbled field. Nicely captured action shot. 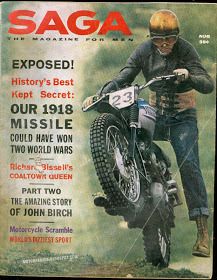 Forty five years ago. I grew up with this most historic event fresh in the conscience of the world and looked on the people who carried out these endeavors as heros. 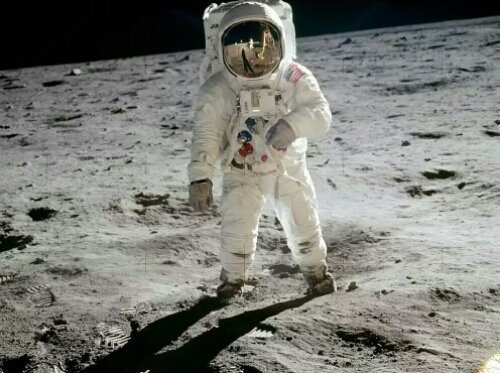 The iconic image of Buzz Aldrin standing in his “magnificent desolation” shows us the simple askew snapshot of a man standing on another planetary body: explorers indeed. 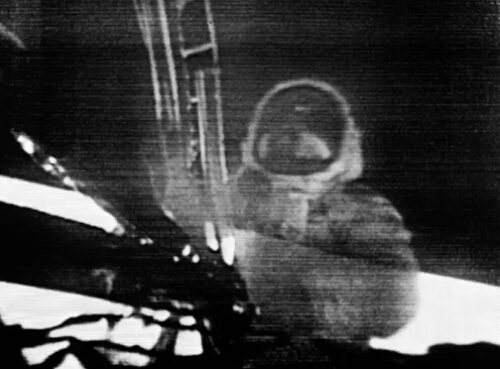 600 million of earths population watched these ghostly images of Commander Neil Armstrong step onto the surface uttering “One small step for(a) man; one giant leap for mankind”. 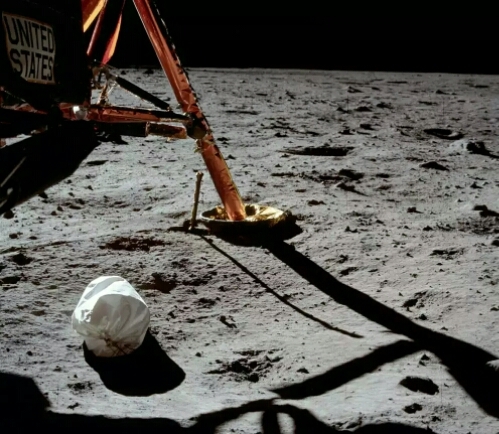 This was his first photograph taken with a space prepared Hasselblad (which is still on the moon) The lunar lander Eagles leg harshly shadowed in the vacuum-clear sunlight. Black sky starless under the lunar sun. 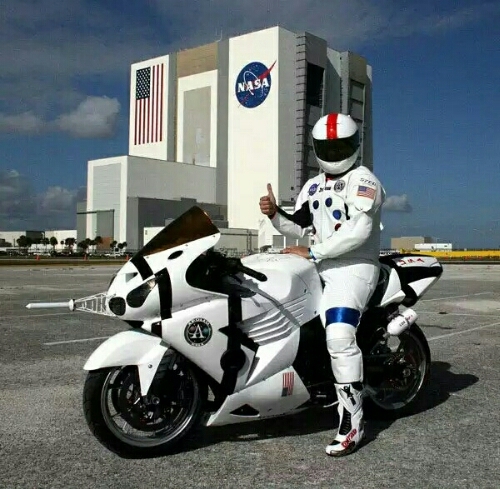 Let’s look at a motorcycling link to the Apollo program: a modern day take on the white NASA color scheme of the behemoth Saturn V. This a Kawasaki ZX14 by 2XtreemTV with appropriate black striping. I don’t know about the noseward escape tower… Even the leathers hint at the bulky moonsuits. 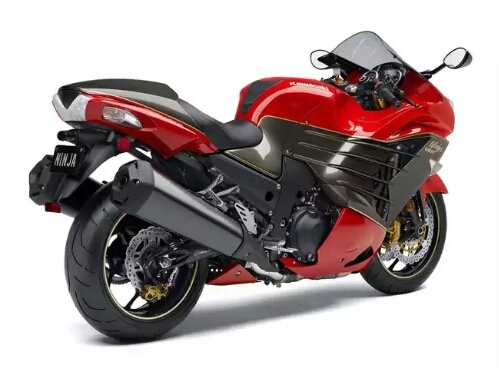 This bike has 350 bhp. Orbit anyone? Now to get a sense if scale the Vehicle Assembly Building behind this rider is where the Apollo rockets (and later space shuttles) were pieced together before rolling out to the launch pad. 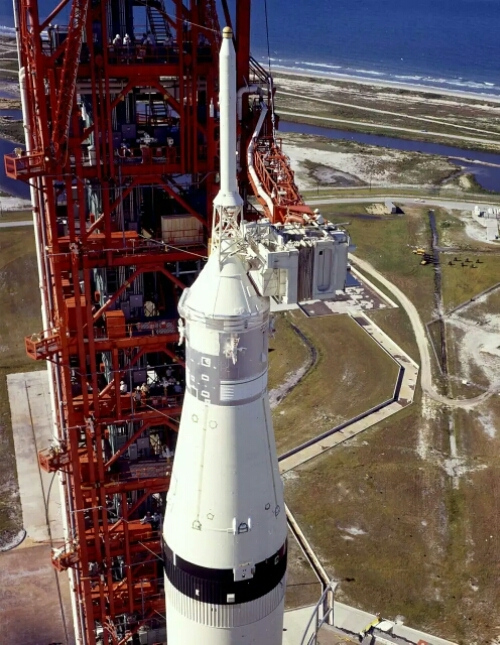 A view of technician working atop the White Room (where the astronauts enter the Command Module). Vast! 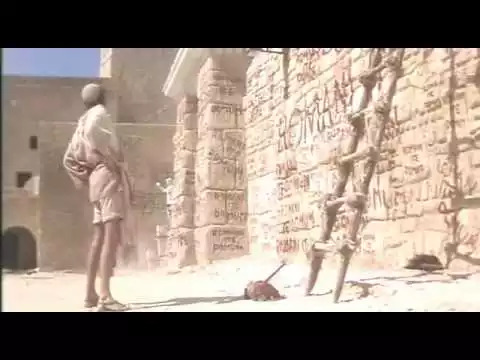 This represents the scale of this venture perfect. It wasn’t one, or three, but thousands who realized this dream. 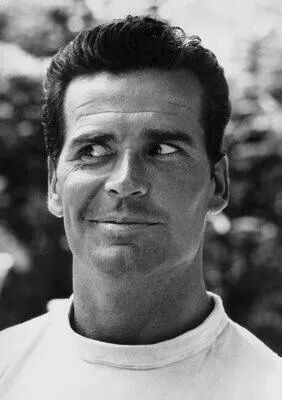 RIP James Garner 1928-2014. One of most laid back Hollywood dudes out there; an effortless charm and good looks too. Whether you remember him from his Maverick days as the titular gambler Bret; or the Pontiac Firebird Esprit driving private eye Jim Rockford, he certainly had a strong worthy character whomever he was playing. Of course I remember him as Hendley; requested items acquisition… Or Scrounger. 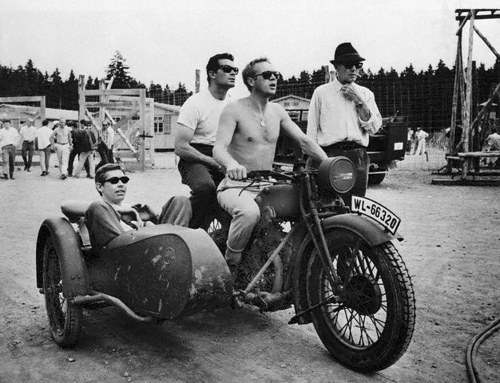 Here he is pillion with buddy Steve McQueen and James Coburn in the chair. His racing career both on and off the screen peaked with the magnificent Grand Prix, the legendary John Frankenheimer film about racing life given pure sixties graphic treatment by the Saul Bass cinematography on 70mm. Garner ad Pete Aron. 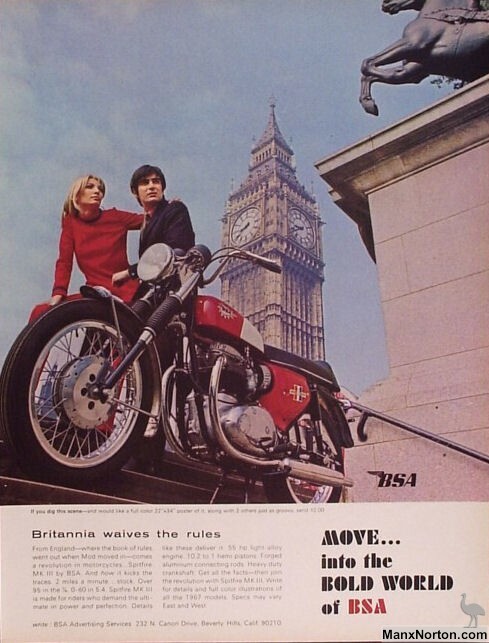 1970 album by Sam the Sham features a colorful mid sixties Triumph ready for e leisurely ride across country…. Like a ‘Brit’ Captain America? 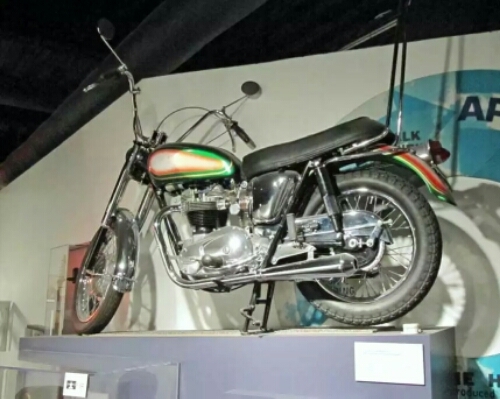 Owned by Sam Samudio (Domingo Samudio) the bike is on display at Rock ‘n’ Soul Museum in Memphis TN. 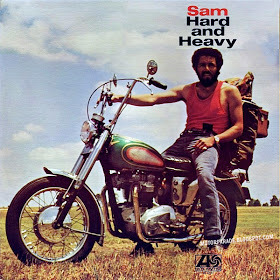 His 1970 album “Sam Hard and Heavy” featured the great Duane Allman’s guitar work on a few tracks. 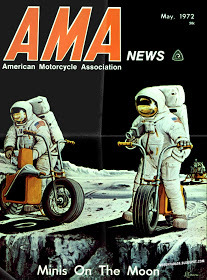 Ridin’ on the Moon; more lunar two-wheeled shenanigans from the cover art of a period AMA magazine. 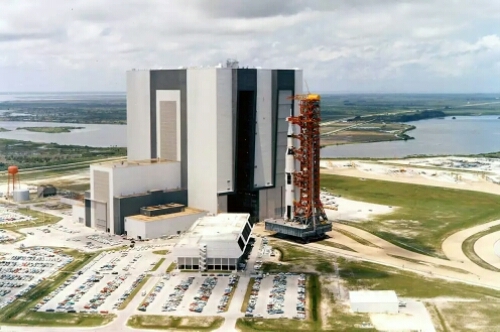 Forty five years ago this week a behemoth Saturn V rocket sped three men to a destination with history a quarter of a million mikes away. 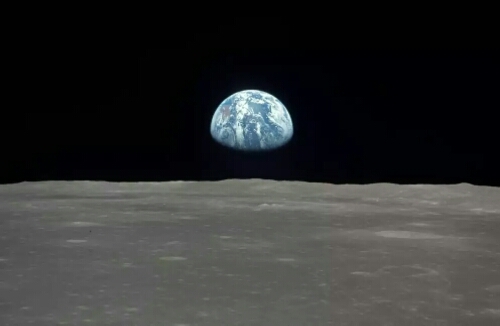 One of the most fantastic achievements of humans acting collectively with a sure goal. 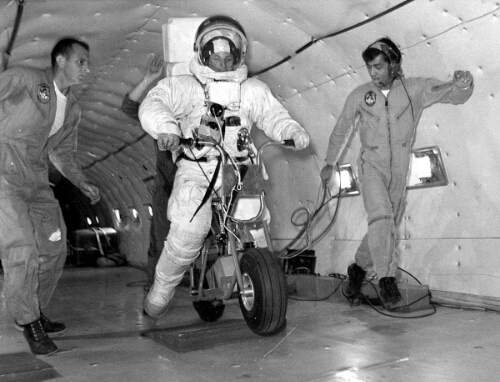 Wouldn’t things have been more fun if they had a moon-moto to scoot about the dusty surface see here being tested in the infamous low gravity inducing ‘vomit comet’.